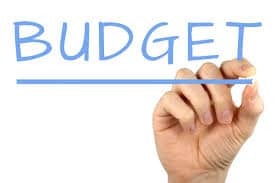 If you are the type of person that doesn’t budget but goes through the month not thinking too much about what you need to pay, then you need to start making changes. It is this type of spending behavior that gets a lot of people into financial trouble, and by then the road back is a hard one. You might think budgeting is hard, but it isn’t that bad, here are a few tips to help you. If you normally use the same account for paying bills and spending on additional things, then it can get hard to remember how much you need to keep in the account. Start by having a separate account for your bills and your spare cash, work out in advance what you need to spend on bills and put that straight in when you get paid. It means that you can set up direct debits for your bills knowing that the money will be in there when it’s needed. If you get paid weekly or fortnightly, then equal out the portion for your bills and transfer it over because that way, you won’t have to find a large amount of money once a month. Once you have separated out your bills from your spare cash, you can decide what you are spending this cash on. When it comes to paying for things, there are two categories: wants, and needs. A need is something like groceries or rent, but a want is something like an expensive pair of shoes. Before you spend anything, think about what category it falls into and see if you have the money to cover it. Sometimes you can get hit with a big bill that you weren’t expecting. It might be that the car needs fixing, or you have a problem in your home that needs to be repaired. These bills are not easy to prepare for, but if you have been saving, then this can help. If you don’t have any savings, you might need to go for a personal loan to help you. It is a good idea to compare them on sites like EnjoyCompare’s website so you can get the best repayment deals. To try and keep track of your budget, see if you can stick to one form of payment. It doesn’t matter if you use a credit card, cash or a debit card, as long as you don’t have multiple payments. It can make things more difficult when you are trying to balance your budget if you have to check multiple statements. If you are using a credit card, you need to see if you will be incurring any charges that make it unfeasible. Once you have started to balance your budget, you should find that it will only take a little while each week to keep it up to date.